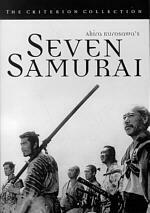 One of the most visionary, deeply personal works in the 60-year career of the master behind Rashomon, The Seven Samurai and Ran. Featuring eight episodes rich in imagery and insight (and casting Martin Scorsese as a feisty Vincent Van Gogh), it explores the costs of war, the perils of nuclear power and especially humankind's need to harmonize with nature. You will be enchanted ... and enthralled. 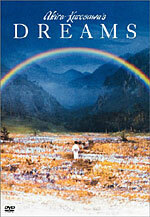 Akira Kurosawa�s Dreams is an interesting film � it�s a collection of eight dream sequences by one of the greatest film visionaries that ever lived � Akira Kurosawa. The director claims that these sequences were actually dreams that he personally experienced over the years and then turned them into a poetic screenplay that doesn�t really run so much as a story as it does as hauntingly beautiful and loosely related interstitials. Admittedly, it requires some rather strong focus and attention to find the macrobiotic structure contained within the film and its stories, but the more you watch, the more you understand � and the more the film speaks to you. While growing up, Kurosawa was a huge fan of Hollywood Westerns and as many of you know, it led him to correlate the Samurai culture with the Western gunslinging culture in such classic films as Yojimbo and The Seven Samurai. At the time, little did Kurosawa know that his sagas would become the primary influence for such Western genre greats as The Magnificent Seven, as well a huge inspiration for some of Sergio Leone�s Spaghetti Westerns. However, Kurosawa�s reach extends far beyond the Western, as The Hidden Fortress was ripped off - and �Samurai� was replaced with �Jedi� in one of my generation�s greatest film, Star Wars. 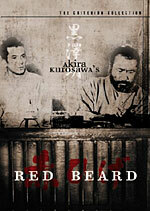 In addition, who can forget his other incredible works like Rashomon, Red Beard, and Ran? In the film at hand, Dreams, Akira Kurosawa uses a character by the name of �I� (Akira Terao) to loosely connect each of the dreams, as he serves as our conduit for each of these individual, surreal journeys that being with �Sunshine Through The Rain� and �The Peach Orchard�. In these episodes, we meet I as a little boy and we are able to catch a glimpse of the director�s love for nature and the environment, as well as how he sees mankind connecting with them and it�s all vividly brought to life with stunning and spectacular imagery. In �Sunshine�, young I is told not to venture out in to the forest, as a period of rain in the village has been followed by a period of sunshine and he�s told that it�s on days like this that foxes hold their wedding ceremonies and processions � and they do not like being watched. Being mischievous, he goes anyway and is quickly discovered by the foxes and must pay the price for spying on them. The punishment is quite harsh, but the forgiveness is absolutely beautiful. The next two episodes are �The Blizzard� and �The Tunnel� and both are much more bleak and uninviting than our two previous outings. In these two segments, we find ourselves, as well as I, in deep meditations about gloomy subjects like death and war. �Blizzard� deals with a group of four men from a mountain climbing expedition who are lost in a blizzard and are on the verge of death. All but the leader of the group are ready to stop and rest, but the leader knows that if they fall asleep, they will surely die. Then, a siren rises up from the storm and speaks to the leader to give him the strength and motivation he needs to carry on. When he answers her call, the snowstorm dies down and we see that the men are right in front of the camp they were searching for. In �The Tunnel�, we meet a military commander returning home from war and we learn that he�s the only survivor from his regiment. As he�s on his way back home, he meets his ghostly comrades and they begin their plaintive march towards town. However, much closer to home, he is forced to explain to the men that they are dead and simply cannot go with him. Afterwards, he sends them back through the tunnel and apologizes for being the only one left alive. Very moving to say the least. Next up is �The Crow� and here, an art student is literally transferred into a Van Gogh painting and while walking through the gorgeous landscapes and countrysides that the artist walked, he meets the painter himself (played by Martin Scorsese). In an absolutely elegant sequence, the artist and the admirer walk through many of the artist�s paintings and Van Gogh espouses many of Kurosawa�s opinions and attitudes about art. Visually stunning and very playful. A really nice sequence. The next two episodes, �Mt. Fuji in Red� and �The Weeping Demon�, jump back into more somber subject matter by reiterating Kurosawa�s strong feelings against nuclear power/technology, as well as his stance against war (mainly nuclear war) and the destruction it causes. In �Fuji�, a nuclear power plant executive/scientist, as well as a mother and her two children helplessly watch the devastation and desolation that is caused when the power plant experiences a meltdown. With the plant being positioned behind Mt. Fuji, it makes it look as if the great volcano has sprung to life once again. Very haunting and disturbing imagery here and it�s quite obvious the point that Kurosawa is trying to make about the arrogance of science and the dangers of nuclear power/energy. During �Demon�, we see someone walking across a charred and barren wasteland that was once the earth as we know it. A demon approaches the man and explains that he was turned into a demon after surviving the nuclear attacks. The fallout from the missiles has caused plants and animals to severely mutate and because of that, those left have had to resort to cannibalism. However, there�s a hierarchy involved, as the demons with more horns eat the demons with less. It seems that the more horns a demon has, the more harm it did to humanity during its life and therefore, it feels more pain with each and every horn it grows. The horns serve as some cosmic justice/curse on the demon and immortality in this �hell on earth� serves as part of their punishment. Here, Kurosawa seems to portray what he sees as a fitting fate for government officials and arrogant humans everywhere who think the world should be ruled with nuclear authority. While the �hell on earth� imagery is quite haunting, the sequences can become a bit overly preachy. However, not to end the film on a down note, Kurosawa finishes off Dreams with �Village of the Watermills� � a snippet espousing the advantages of the simple life and the serenity and tranquility it brings. A hiker happens upon a small village and sits down with an elderly resident to discuss the pace and way of life there. It�s an affirming way to close things out and it reinforces Kurosawa�s belief that we should do all we can to commune peacefully with nature. As the two talk, they hear music approaching from the distance and the old man explains that it is a funeral - the town feels that hard work and living to old age are things that should be celebrated, not mourned. A fitting end and an inspiring lesson that we could all learn from. Oddly enough, there�s a group of folks who think that the film was a bit self-indulgent and overdone � a visually striking film that at times, borders ever-so-slightly on gaudiness and flamboyance. But there�s a much larger contingent telling that crowd to �Shut Up!� and enjoy the film for what it is � a breathtaking and magical journey that was a perfect summation of an incredible career. Warner has done a quite impressive job on the transfer for Akira Kurosawa�s Dreams and preserved the film�s theatrical aspect ratio of 1.85:1 with a nicely done anamorphic transfer. While there are small imperfections here and there, the film stands up as a well-tuned transfer that isn�t lacking much. The transfer maintains a fairly tight and defined image throughout, with only the occasional print flaw or speck showing up to mar the proceedings. The colors are brilliantly and faithfully reproduced and never suffer from any sort of oversaturation or smearing, while balance was right on the money. Black levels were fairly solid, but not as strong as I�d liked for them to have been, but ultimately, shadow detail and delineation were well above average and allowed for a nice film-like appearance. Flaws with the image were run-of-the-mill, but showed up consistently enough to keep the film from reaching the upper-echelon of high-end transfers. There was a slight amount of grain that was noted in certain scenes, as well as the occasional flake and fleck seen on the print. Shimmer was noted once or twice, but nothing in the way of edge enhancement or pixelation. Again, it�s one of those situations where the flaws are fairly common and non-distracting, but their numbers cause the score to stay down somewhat. Not perfect, but not too terribly far from it either. Warner has done an excellent job transferring this absolutely gorgeous film to DVD and fans of Kurosawa and his work will literally eat it up. Very nice job to say the least. 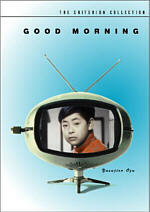 Thankfully, the film maintains its original Dolby Digital 2.0 Surround track in its native Japanese language. While it doesn�t sound like there was much restorative work done on the audio, it works well for the material at hand. Akira Kurosawa�s Dreams is the perfect package � an incredible mix of stunning imagery and atmospheric effects and in my opinion, a film that literally screams for a 5.1 mix with its multiple atmospheric elements that are simply too numerous to mention. Would�ve, could�ve, should�ve � it doesn�t matter, as hoping for a Dolby Digital 5.1 mix at this point is nothing but a waste of time � time that would be better spent enjoying what we do have. The film is front surround heavy and Warner�s mix does a good job of conveying a rather expansive soundstage all things considered. The audio transfer contained excellent dynamics and fidelity and sounded fairly strong for a 2.0 mix. Even so, inherent to its nature, the 2.0 mix contains little in the way of impressive rear surround usage and while separation was good, it�s far from great. Dialogue was front and center, with only a slight tinge of harshness on occasion, but it never adversely interfered with what was being said. Warner has also included English, French, Spanish, Portuguese, Japanese, Thai and Korean subtitles, as well as English Closed Captions. Warner leaves the Special Features department lacking somewhat, as all we get here are a Cast and Crew section, as well as an Awards section. Both contain static text that highlight those who worked on the film, as well as personal accolades that Kurosawa received. Warner has done an excellent job on this disc all the way around and while you won�t see it on any �Best of 2003� lists for its technical merits, it still looks grand and Warner is to be commended for having the film look and sound as good as it does. They have done Kurosawa�s film justice and with the low retail price Warner has slapped on the disc, it�d be a shame for cinema fans everywhere to not have this one in their collection.